Last winter I spent a season snowboarding in the French Alps. I lived in a town below the resort of Les Arcs called Bourg St Maurice (73700). During my time there I took an obscene amount of photographs. It seemed only right that I setup this site, as a resource to those wishing to visit the Les Arcs area & for my fellow seasonaires. The majority of the images are landscapes with the occasional self portrait of myself. If you are looking for images of people (under the influence) then check the 'nights out' section. 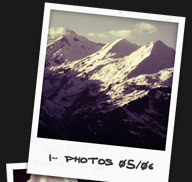 Access the photographs by clicking on the polaroids to the right. 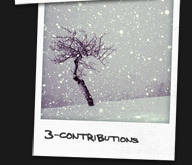 Lurking down at the bottom of the page is a 'contributions' section. If you were in BSM last season then send me a photo or two and I shall slap them up on the site. So far, all the photographs in that section, were took by or are featuring the talented James Phillips. Thanks for that. If you have any comments, suggestions or would like a copy of any of the photos on the site, feel free to contact me. To all those who I met throughout the season, thanks for all the good times. Enjoy the summer.